The Foundations of Vacuum Coating Technology, Second Edition, is a revised and expanded version of the first edition, which was published in 2003. The book reviews the histories of the various vacuum coating technologies and expands on the history of the enabling technologies of vacuum technology, plasma technology, power supplies, and low-pressure plasma-enhanced chemical vapor deposition. The melding of these technologies has resulted in new processes and products that have greatly expanded the application of vacuum coatings for use in our everyday lives. 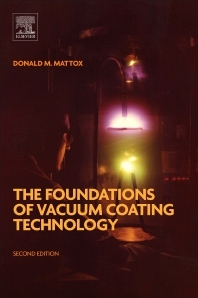 The book is unique in that it makes extensive reference to the patent literature (mostly US) and how it relates to the history of vacuum coating. The book includes a Historical Timeline of Vacuum Coating Technology and a Historical Timeline of Vacuum/Plasma Technology, as well as a Glossary of Terms used in the vacuum coating and surface engineering industries.